When I tell someone I’m a blogger, I get a reaction like, “Oh, how nice…” Their eyes glaze over and they don’t take me very seriously. Can you relate? Most people who aren’t in the blogging world don’t understand that blogs are businesses. Sure, some people have hobby blogs (which are still fantastic! ), but if you have a blog in hopes of monetization, your blog is a business. And it should be introduced and treated like one! 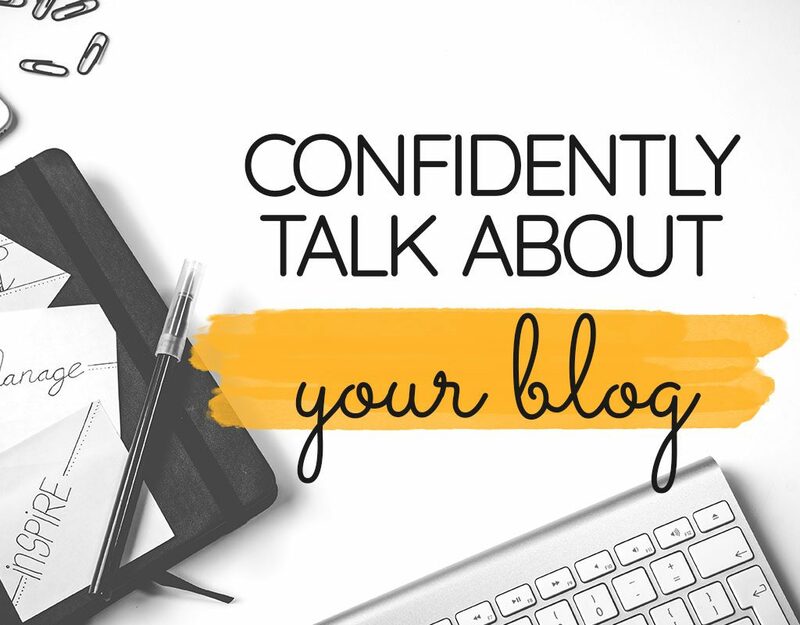 Here’s how to confidently talk about your blog. Because, like it or not, other people’s perceptions of our work impact us. When I’m talking about my dreams for my blogs, I hate the response, “Oh, that’s nice…” I feel like an idiot! I fully believe in the potential of my blogs and I am so proud of them. How much better could they be if I confidently told my family and friends about what I do every day? And have them be interested! Mind. Blown. I’m a writer. A graphic designer. A webmaster. An email marketer. A social media marketer. I wear so many freaking hats which makes it hard to tell other people what I do! So, how should we talk about our blogs? How can we treat our blogs more like businesses and less like some low-key side biz? How do we talk about this?? Here’s my consensus. The phrase, “I’m a blogger,” is so worn out. I’m vowing to stop using it and start saying, “I have a blogging business,” or, “I’m an online business owner.” The reality is that there are so many facets to being a blogger that simply calling yourself a blogger doesn’t cut it. By rephrasing our work, it allows us to introduce all the different parts of our business. Bear with me on this one. When I started Organized Blogging, I wanted to think of it as a business from the get-go (more than just a blog). So much so, that on my computer I put my Organized Blogging folder within my Clients folder (I do some client work on the side). I view my clients as having legit businesses. Why shouldn’t this be a legit business?! When asked at a party, “What do you do?” Chef A says, “I’m a home chef.” Boom, end of the conversation. Chef B says, “You know how a lot of families don’t have time during the week to make meals? Well, I prepare meals in the family’s home so they can focus on their family and activities.” How much BETTER is that?! How much more likely is that to spark a conversation? Intrigue the listener! Instead of, “I have a home improvement blog,” I’m going to start saying, “I have an online business where I teach homeowners how to do their own home improvement projects.” Check. Mate. These are businesses, people! Don’t shy away!! 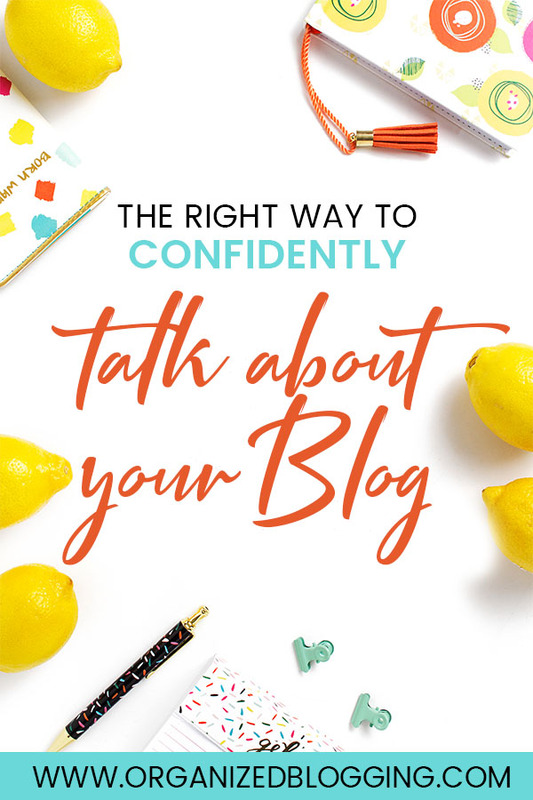 It’s OK to confidently talk about your blog. Okay, I know this might sound a little 1998, but it can actually work. Plus, it’s great if the people you meet in real life are actually interested in your business. Create a business card with your name, blog URL, and social media handles. The chance of them actually checking out your blog will be waaayy higher than if you rely on them to commit your blog URL to memory. How do you treat your blog? Do you feel awkward when you talk about it? Or do you own it? I’d love to hear about it! Drop your story in the comments. You’re right; I realized that we are WAAAAY more than JUST bloggers. My husband and I run a blog that also has a YouTube channel and a podcast connected with it. (And that’s along side of our other business–music publishing.) But we’ve been at this for 2 years now and I knew then that saying that we’re bloggers does not adequately characterize what we do. First of all, owning a blog–instead simply writing for a blog–means you do ALL the things (and we’re proud of that and I want people to know). Secondly, because our blog is just one of the three prongs of our larger blogging brand, only mentioning the blog leaves out the videos and podcasts. I listened to that Amy Porterfield episode, too, so I have started telling people that we run a blog that is also a YouTube channel and a podcast, where we, as songwriters, share the resources/experiences/tools/products that inspire us the most, in a hope that others will live a more creative and inspired life. You’re right; that does sound MUCH more compelling than “we’re bloggers.” Thanks for sharing an important topic. Absolutely! You nailed it! It’s so much more than just writing content. We definitely wear a lot of hats! I’m glad this blog post was valuable for you! Thanks for stopping by! This is such a needed post! We’re just starting out our blog (Ticket to FI) and mentioning that we’re starting a blog is an instant conversation killer. People just don’t believe that’s is a legitimate business! We are definitely going to work on our elevator speech though and sell it much more like a business in information. Thanks for sharing! I LOVE this post! This was (and is) a major struggle for me. The feelings of inadequacy are real, especially when your enthusiasm isn’t understood by family and friends. Thank you so much for helping us learn how to see our blogs as a business and to actually give them the respect they deserve! Thank you, Katie!! It has been a struggle for me, too. Hence, why I wrote the post :-). But I honestly believe that it’s all about changing the narrative when talking about your blog and helping people understand that it’s a real business!! So happy to help!